As a follow up to my last post on colcha embroidery, Julia Gomez was kind enough to send in a photo of her incredible masterpiece, El Jardín de las Golondrinas (The Garden of Swallows). 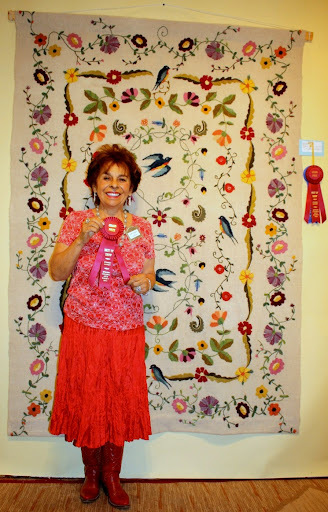 It won Best of Show at the Santa Fe Spanish Market in 2010 and is currently on display in the Albuquerque Museum through March. Sure wish I could see it in person – isn’t it great? She also has kits for sale, but you’ll have to contact her directly for details. This entry was posted in Colcha embroidery, Embroidery around the world and tagged colcha embroidery, embroidery, Julia Gomez, New Mexico, wool. Bookmark the permalink. Well, you’d have to ask Ms. Gomez – you can find her contact info on her website!